The practice of loving and being loved is a constant discipline and not something to be taken for granted. If the old adage is true and “love really does make the world go round,” how can we be more open to love in the many ways it manifests itself in our lives, and in the lives of others? In one of my favorite books of all time, “True Love,” the Buddhist monk Thich Nhat Hanh, beautifully states: “Love is to recognize; to be loved is to be recognized by the other.” So simple, and yet, so challenging. What recognition means to me is saying, I see you; I affirm your humanity. 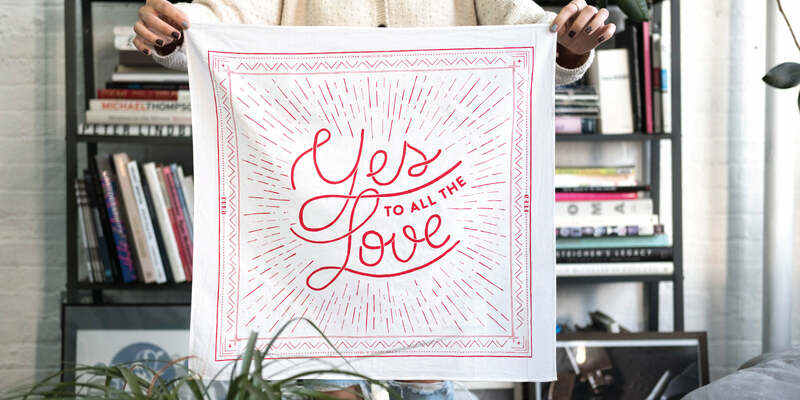 It is saying yes to all the love—being willing to recognize love in the other, and to recognize the other’s worthiness to be loved – no matter who they are, where they come from, or how their love, or their definition of love, may differ from yours. We’re using Valentine’s Day as an opportunity to spread this crucial message in a fun way that we’re excited to wear and share – but the magnitude of love cannot be contained to a chocolate-filled holiday. I hope you’ll join us in proclaiming Yes to all the love, on February 14th and beyond. And maybe wearing a really cute bandana while you’re at it. The All Love Bandana in white.